Angela Merkel on Monday announced she will quit as German chancellor when her mandate ends in 2021, as she sought to draw a line under a series of political crises that have rocked her fragile coalition. Taking a decisive step towards the end of her political career, the veteran leader who has led Germany for 13 years said she hoped her planned departure would end bitter fighting in her coalition and finally focus it on its task of governing Europe’s biggest economy. “Today, it is time to begin a new chapter,” she told reporters at her party headquarters. Referring to the quibbling within her coalition that has sent it from the crisis from the crisis, Merkel noted that “the picture that the government is sending out is unacceptable”. Electoral drubbings like the latest on Sunday in the state of Hessen were “a watershed, but in them could lie a chance”, Merkel said, for Germany’s mainstream political parties including her own to find a way forward. Merkel, 64, will stagger her political exit by first giving up the leadership job of her Christian Democratic Union in December, which comes up for reelection during a party congress in December. She added that she would not stand in Germany’s next elections nor seek to renew her mandate as chancellor when her fourth term ends in 2021. At least four candidates declared their interest to seek Merkel’s job after she made her stunning announcement. But she said she would not name a successor. “I will accept any democratic decision taken by my party,” she said. Often hailed as the world’s most powerful woman and Europe’s de facto leader, Merkel’s power has been on the wane since her 2015 decision to keep Germany’s borders open at the height of Europe’s migrant crisis, ultimately allowing in more than one million asylum seekers. The mass arrivals deeply polarised Germany and are credited with fuelling the rise of the far-right. At the same time, the AfD’s rise has prompted her conservative Bavarian allies CSU to champion hardline immigration policies, something that in turn sent moderate voters drifting to the centre-left Greens. AfD leader Joerg Meuthen hailed Merkel’s planned departure as “good news”. AKK to take the reins? Die Welt reporter Robin Alexander said the path could now be clear for CDU general secretary Annegret Kramp-Karrenbauer, nicknamed AKK, to take the reins. “The two women have taken back the momentum because none of their opponents was ready for this,” he tweeted. But other contenders are waiting in the wings, including ambitious health minister Jens Spahn, a frequent Merkel critic. The Frankfurter Allgemeine Zeitung said Sunday it would be “a mistake” for Merkel to cling to power. Merkel’s first step towards the exit is likely to send ripples across the European Union, where she has served a beacon of stability as the bloc grapples with multiple global crises, Brexit and an unpredictable ally in the White House. While still widely respected abroad, her recent domestic woes have kept Merkel away from the European stage, thwarting French President’s Emmanuel Macron’s push to reform the eurozone with Merkel by his side. Despite her global standing, Merkel has no plans to seek a post in the European Commission after bowing out of German politics, a CDU source told AFP, quashing speculation to that effect in Brussels. 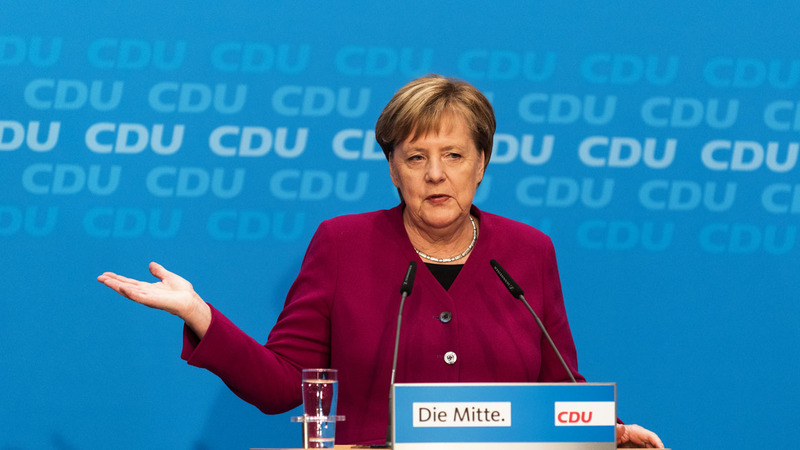 But the woman dubbed the “eternal chancellor” may not get to choose her own timetable — and her departure could be hastened if her junior coalition partner brings down the government before 2021. SPD chief Andrea Nahles said her centre-left party, Germany’s oldest, had failed “to break free from the government” and carve out a clear profile of its own after serving in multiple, compromise-laden “grand coalitions”. She said the SPD would now lay out a “roadmap” in Berlin demanding concrete progress on key issues by next October, including pension rights and better childcare, before deciding whether to remain in the coalition. Increasing numbers of SPD members have been calling for the party to quit the government and lick its wounds in opposition, as it is presently polling below AfD nationwide, at 15 percent to the far-right’s 16 percent.